One of our demo garden MGs brought a pepper seedling leaf in last week with small bumps on the bottom, near veins. It looked healthy otherwise and didn’t have apparent active insects. Then the same thing happened to my pepper seedlings, so I decided to look it up. The issue appears to be edema, which is an abiotic problem usually resulting from overwatering. Basically, the plant takes up water faster than it can use it. With a mild case like this, the simple solution is: don’t water as much! If it persists I may also try adding calcium as a deficiency of that mineral can also be a factor. 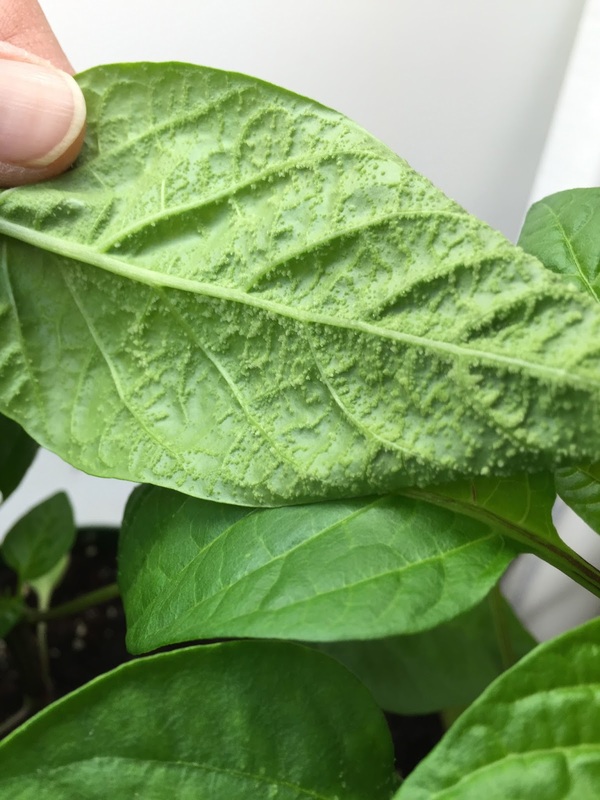 Here is an article on edema from U. Conn. (doesn’t mention peppers specifically, but I made the connection through a hot pepper growing forum, and the many photos similar to mine on the web also help with diagnosis). And on UMD’s HGIC, results of edema at a later stage. Seedlings are best watered deeply and then allowed to dry out on the surface before watering again. This also helps keep fungus gnats away. Make sure your pots have adequate drainage holes and water doesn’t sit in the trays. Cool photo. That's the first time I've seen that on pepper. After you set out your pepper plants don't forget to pinch off the early flowers and fruit for a couple of weeks to produce strong plants that can pump out fruits till frost. And even before you set them out – I've had peppers try to produce fruit while still in their seedling pots. “Nip that in the bud” is a good saying here.